This page is about dressing well. I’m not good at it yet, so it’s a work in progress and shouldn’t be considered authoritative. Please offer help if you’re qualified. 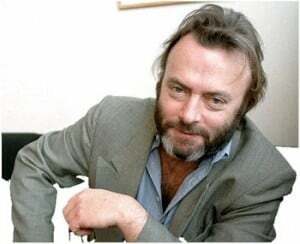 No, that’s not me up there — that’s Christopher Hitchens, perhaps my only hero (who happens to dress pretty well). The philosophy I am going for here is one of timelessness and quality. Have relatively few clothes, all of high quality (we’ll talk about what that means below), and master the fundamentals of classic dress. This way you can be confident that you’re presenting well without having to “dress up” or try overtly to impress, which I’m just not willing to do. Finally, if you don’t quite get it right…so what? Just as with cooking (which I also want to learn), a significant portion of the enjoyment comes from learning the craft. In general, you should not wear undershirts with your shirts. Notice that you don’t see male models or golfers (or generally any good dressers) wearing them. This may be an appeal to authority, but there is reason for it: shirts are meant to sit on your body a certain way. Having a shirt underneath disrupts that, often leading to grabbing and bunching in places that ruins the look of the shirt completely. Also consider that undershirts are, by any definition, underwear. And like the underwear worn around your sensual parts it should be invisible. In the case of undershirts, it preferably should be invisible because it’s not there. There are exceptions to the no undershirt rule, of course. If you plan on sweating profusely, for example if you are going to be in an extremely hot and humid area, you may want to go with an undershirt just to avoid soaking your shirt with sweat, or having wet underarms. Plus, that sweat stain combined with anti-persperant over time could discolor your shirt. And if you’re wearing good shirts, like you should be, this can become a problem. If you absolutely must wear one for the reasons above, see general underwear rule above and make sure it’s completely undetectable. This means buying very silky-like undershirts that hug the body completely and allow the shirt to slide over it like…well, like skin. Most important is the collar: it cannot be visible at all. Again, imagine it’s your underwear poking out of your pants. Not. Acceptable. Simple rule: don’t wear undershirts. If you have to, it should look precisely the same as if you weren’t. The rules of clothing quality are quite expansive, so I’ll thankfully only be focusing on what I know. First of all, I’m male, which is lucky because it seems I’d need several books to approach this topic properly for women. Anyway, the first issue is that of fabric. Use high quality fabric. High quality means natural, i.e. not polyester, rayon, plastic, whatever. You want genuine, real-deal material. Second: you don’t want writing on your clothes — not showing outwardly, I mean. Wearing clothes with legible writing on them is low. And yes, this includes logos. Don’t wear any sort of symbol or logo or writing on your clothing. Nobody should know or care where you got them from. The only thing they should notice is that they’re of a high quality and do precisely what nice clothes should do, which is amplify your awesome. They may come from some place they’ve never heard of, or a quality name they know — but they’ll have to ask because you’re not going to have it written on your damn shirt. And the good news is the brand-name types won’t wear what you’re wearing because it DOESN’T have a logo. That’s a win for us.